You work for the Time Travel Investigation Agency, a job which, to be honest, is mind-meltingly dull. That is, until a raving lunatic in a lab coat breaks the laws of physics and drastically alters the space-time continuum (changing your memory right along with it). Set off on a wild adventure through the Mesozoic Era, the Middle Ages, the steampunk 1880s, and the distant future in an attempt to safeguard the true timeline. The timeline where people evolved from dinosaurs. 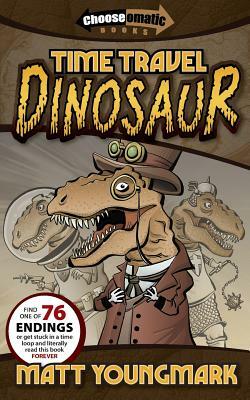 Time Travel Dinosaur is a sci-fi/comedy reimagining of the choose-your-own-path stories you grew up with. Find one of 76 possible endings, or get stuck in a time loop and literally read this book forever.